Napier Menzshed (sometimes mistakenly spelt as Mensshed) is one of thousands of similar mens sheds that have sprung up around the world. We are part of "Menz shed New Zealand". The Napier shed, in Hawkes Bay, is well equipped with tools and machinary to tackle most projects. To provide a safe place and space for men to meet, socialise, share and learn skills, create projects and be involved in their community. In a sense, it is a health initiative for retired men, a step away from isolation and into the camaraderie of a shared project and community appreciation. This is furthered by the mandatory 'Smoko Break' which was so much part of the work scene for blokes. 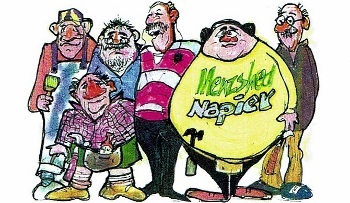 Napier Menz Shed brings experiened men together to share skills, learn new skills and have a natter and a laugh in a supportive shared space. Men can work on individual projects to build something practical or create something fanciful. We also work in groups on community projects.If you just want to have a cup of tea or coffee and a natter with friends, that's ok too.